Anywhere there is great fishing, cold mornings do not stop avid fishermen from heading out on the water. 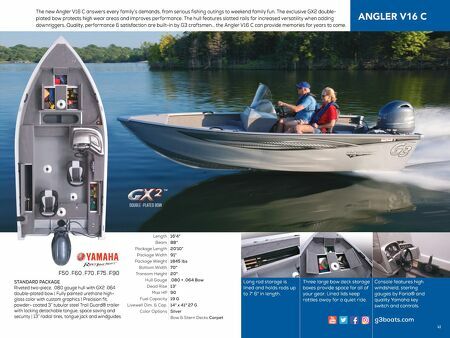 The Angler V16F has deep cockpits and high consoles with tall windshields to keep wind and water at bay during frigid rides to your favorite hot spot. 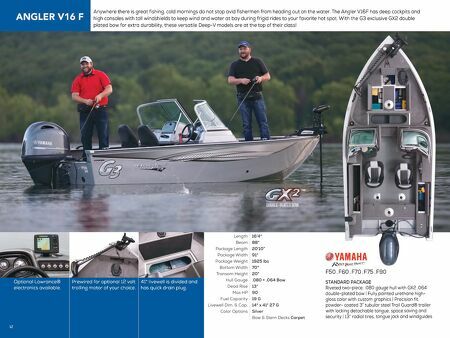 With the G3 exclusive GX2 double plated bow for extra durability, these versatile Deep-V models are at the top of their class! STANDARD PACKAGE Riveted two-piece, .080 gauge hull with GX2 .064 double-plated bow | Fully painted urethane high- gloss color with custom graphics | Precision fit, powder- coated 3" tubular steel Trail Guard® trailer with locking detachable tongue, space saving and security | 13" radial tires, tongue jack and windguides Optional Lowrance® electronics available. 41" livewell is divided and has quick drain plug. F50 . F60 . F70 . F75 . F90 16'4" 88" 20'10" 91" 1925 lbs 70" 20" .080 + .064 Bow 13° 90 19 G 14" x 41" 27 G Silver Bow & Stern Decks Carpet Length Beam Package Length Package Width Package Weight Bottom Width Transom Height Hull Gauge Dead Rise Max HP Fuel Capacity Livewell Dim. & Cap. Color Options 42 Prewired for optional 12 volt trolling motor of your choice.